Can you draw this circuit conveniently? It made Boojho wonder if there was an easier way to represent these electric components. Some common electric components can be represented by symbols. 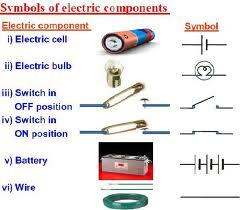 some electric components and their symbols are shown. You may come across different symbols for these components in different books. However, in this book, we shall be using the symbols shown here. Look at the symbols carefully. In the symbol for the electric cell, notice that there is a longer line and a shorter but thicker parallel line. Do you recall that an electric cell has a positive terminal and a negative terminal? In the symbol of the electric cell, the longer line represents the positive terminal and the thicker, shorter line represents the negative terminal. For a switch the ‘ON’ position and the ‘OFF’ position are represented by the symbols as shown. The wires used to connect the various components in a circuit are represented by lines. A battery and its symbol are shown. Do you know what a battery is? Look at the symbol of a battery. Can you make out what a battery could be? For some of the activities we may need more than one cell. So, we connect two or more cells together. Notice Symbols for some electric circuit components. Take an electric cell, a bulb, a switch and connecting wires. Make an electric circuit. This activity has to be done using only one cell. Keep the switch in the ‘OFF’position. Does the bulb glow? Touch the bulb. Now move the electric switch to the ‘ON’ position and let the bulb glow for a minute or so. Again touch the bulb. Do you feel any difference? After moving the switch back to the ‘OFF’ position, touch the bulb again. Make a circuit. Take about 10 cm long piece of nichrome wire and tie it between the nails. (You can get nichrome wire from an electric repair shop or you can use a piece of discarded coil of an electric heater.) Touch the wire. Now switch on the current in the circuit by moving the switch to the ‘ON’ position. After a few seconds touch the wire. (Do not hold itfor a long time.) Switch off the current. Touch the wire again after a few minutes. The wire gets hot when an electric current passes through it. This is the heating effect of the electric current. Can you think of any electric appliance where the heating effect of the electric current is used? Make a list of such appliances. You might have seen an electric room heater or an electric heater used for cooking. All these contain a coil of wire. This coil of wire is called an element. You may have noticed that when these appliances are switched on after connecting to the electric supply, their elements become red hot and give out heat. The wires used for making electric circuits do not normally become hot. On the other hand, the elements of some electric appliances become so hot that they are easily visible. 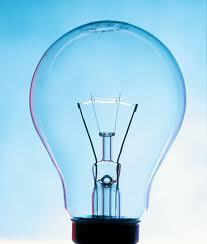 The filament of an electric bulb gets heated to such a high temperature that it starts glowing. If a large current passes through a wire, the wire may become so hot that it may even melt and break. But is it possible for a wire to melt and break? Let us check it out. Make the circuit we used for the activity again. However, replace the cell with a battery of four cells. Also, in place of the nichrome wire, tie a thin strand of in electrical appliances.steel wool. (The steel wool is commonly used for cleaning utensils and is available in grocery shops.) If there are any fans in the room, switch them off. Now pass the current through the circuit for sometime. Observe the strand of steel wool carefully. Note what happens. Does the strand of steel wool melt and break? Wires made from some special materials melt quickly and break when large electric currents are passed through them. These wires are used for making electric fuses. In all buildings fuses are inserted in all electrical circuits. There is a maximum limit on the current which can safely flow through a circuit. If by accident the current exceeds this safe limit, the wires may become overheated and may cause fire. If a proper fuse is there in the circuit, it will blow off and break the circuit. A fuse is thus a safety device which prevents damages to electrical circuits and possible fires. Fuses of different kinds are used for different purposes. Fuses are generally used the nichrome wire, tie a thin strand of in electrical appliances. We observed the heating effect of the electric current and learnt how we use it to our advantage. Does the electric current have other effects also? It is convenient to represent electric components by symbols. 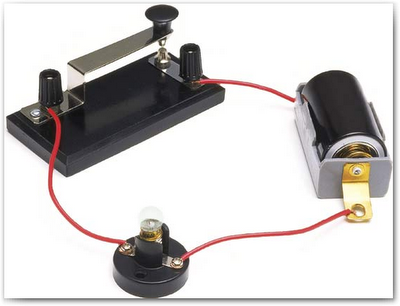 Using these, an electric circuit can be represented by a circuit diagram. When an electric current flows through a wire, the wire gets heated. It is the heating effect of current. This effect has many applications. Wires made from some special materials melt quickly and break when large electric currents are passed through them.